Bears | BROOKLIN MODELS | Brooklin Models by Manufacturer | M.G. The first Y-Type off the production line in 1947 cost around £671.00, a considerable proportion of which was purchase tax. Described as the 'one and a quarter' saloon (referring to the 1 1/4-litre) it was a 'very capable and obliging car' and could show a clean pair of heels. 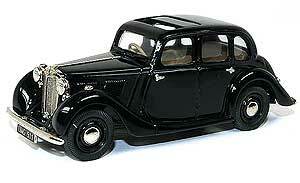 In the mid 1930s MG decided to enter the big sporting saloon car market. 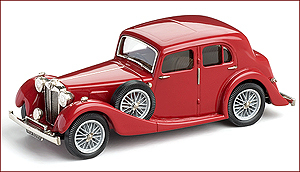 This model, which competed directly with Jaguar's new SS saloon, used a similar engine to Wolseley's 18-85, thus showing the increasing influence of Morris within the company. 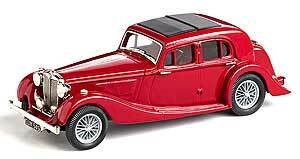 Styling was clean and dramatic with a long bonnet and sweeping front wings. The interior featured leather trimmed seating and wooden dash and door cappings, decorated with thin marquetry inlay.